Grain Extract is the lecithin extract from beans and provides the lipid air permeable coating that helps protect the hoof capsule from excessive moisture while still allowing the hoof capsule to breathe. The protective fatty acid coating provides the added benefit of a shine. 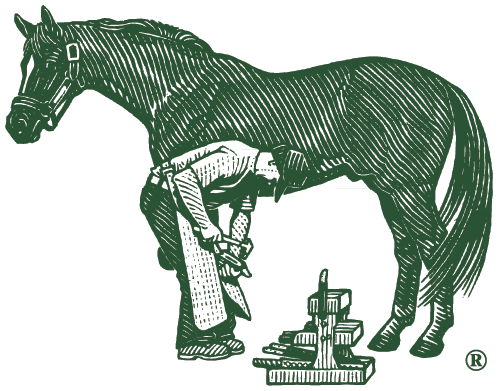 Amino acids along with the fatty acids in Farrier’s Finish® function as a surfactant much like soap; however the amino acids are less irritating to the tissues than soap. The surfactant properties allow Farrier’s Finish® to penetrate into small cracks and defects in the hoof capsule. Another benefit of applying amino acids topically is the moisture holding capacity of amino acids helps the tissues maintain normal hydration. The topical application of amino acids is believed to directly benefit the protein structure of the dermal tissues but this property has not been scientifically verified. Propane-1, 2-diol, also known as propylene glycol, acts as a dispersing agent and also has preservative properties. Tea Tree Oil is plant derived oil that has strong tissue penetrating capabilities and mild antimicrobial activity. Propan-2-ol, also known as isopropyl alcohol, is added to Farrier’s Finish® in a minimal quantity to serve as a fast drying agent. Iodine provides antimicrobial function with minimal tissue irritation. Yucca Extract is plant derived and functions to neutralize the harmful ammonia from urine soaked stalls.